Almost the first thing we did when we moved into our new house last Summer (apart from put he kettle on) was to invest in the biggest greenhouse that we could sensibly fit into our new back garden. We hoped that the 8’x10′ we opted for would offer more than enough working and storage space to meet our needs. It really should have done, but thanks to these cold snaps that the weather keeps throwing at us, we’re rapoidly running out of room. We’ve currently got about as much heavy duty plastic shelving crammed into the place as we can sensibly fit and pretty much every shelf is taken up with plants in various stages of development. 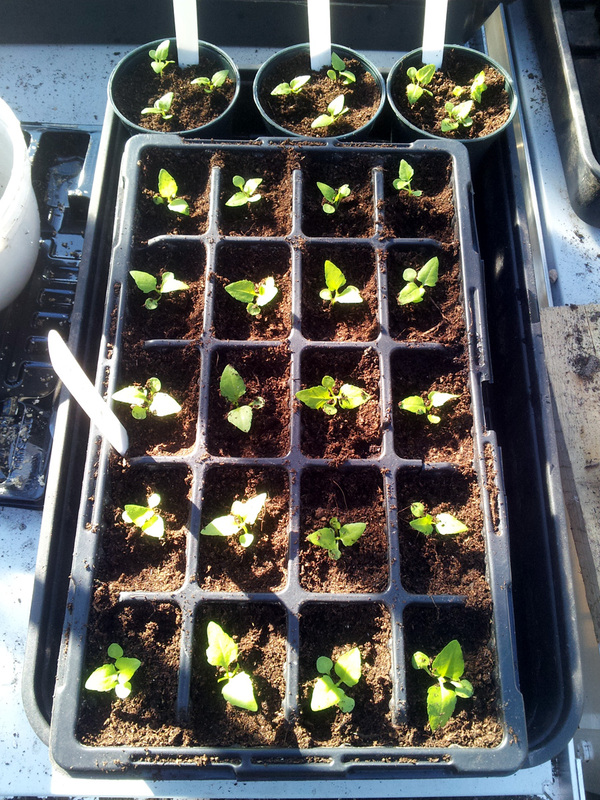 They range from newly-sown seeds – I put in some peas at the weekend; sweetcorn, gherkins, squash and kale in the last couple of weeks, and Jo has been working hard on her flower selection – through to good-sized plants – the broad beans for instance, and the dahlia tubers – which are pretty much ready to go out onto the allotment. 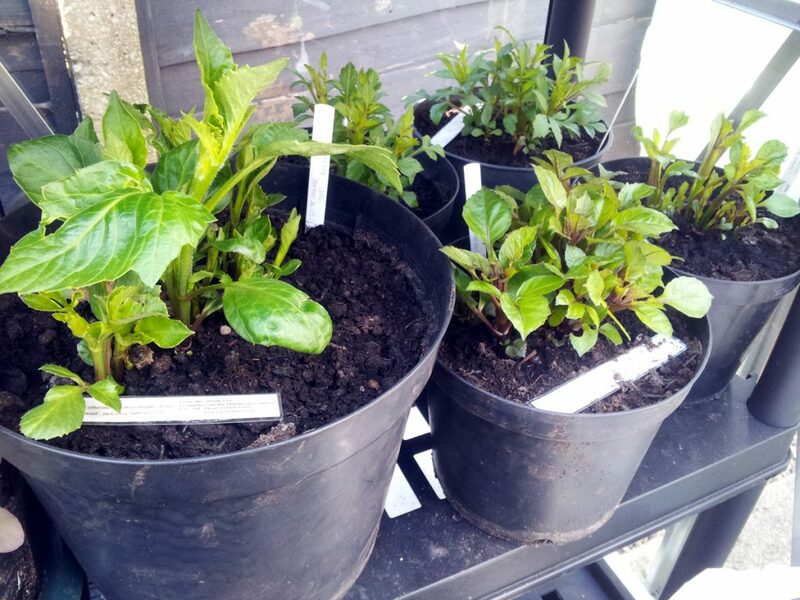 That is, they would be if it wasn’t too darn cold to risk trying to harden them off in the cold frame, and there wasn’t a very real danger of frost and snow showers damaging the tender young shoots if we did. 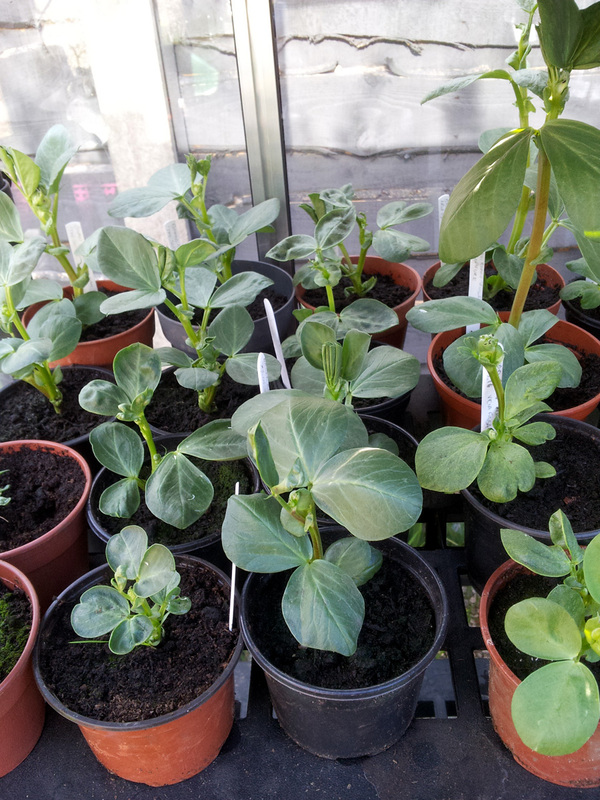 I reckon most of these Vicia faba (broad beans) are ready to be planted out. 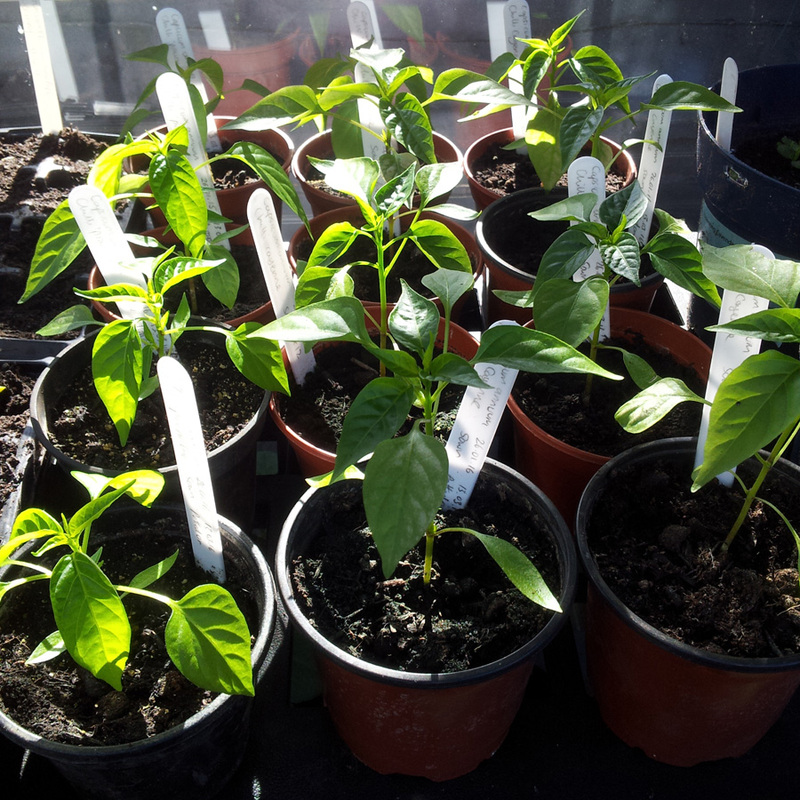 The Capsicum annuum / chinense (chillis) are coming along nicely – further updates in another blog post soon. 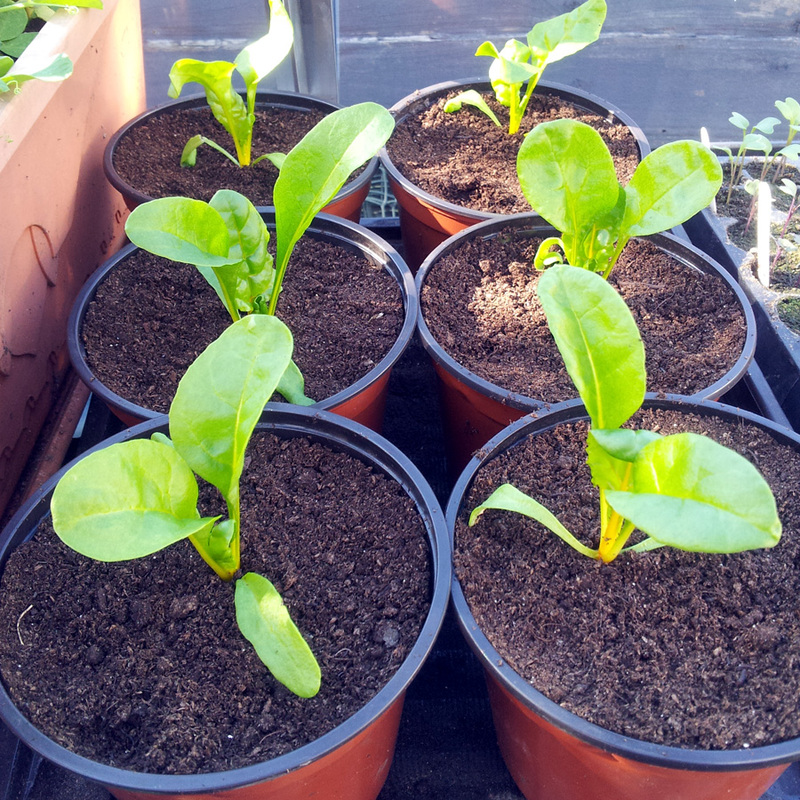 Beta vulgaris Swiss chard ‘five colours’… 100% yellow in our case. 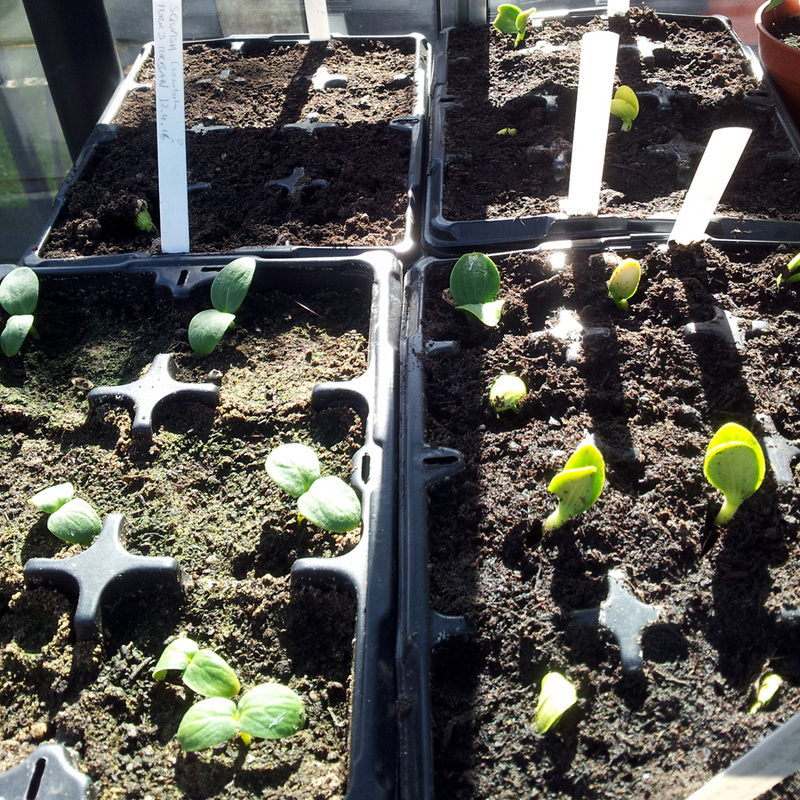 Recently-sown and newly-germinating members of the Cucurbitae family (squash and gherkins). The dahlia tubers we invested in seem to be doing rather nicely. 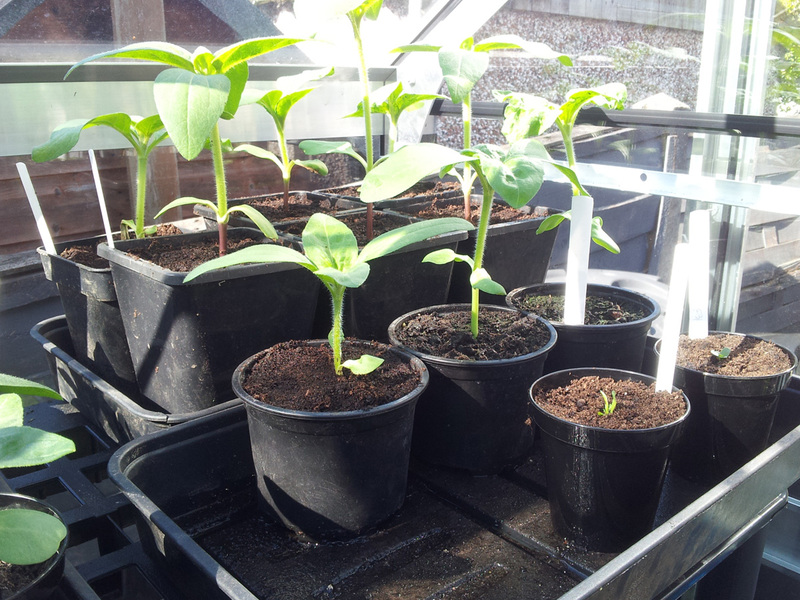 Jo’s sunflowers are growing well – some will need to be potted on again soon. 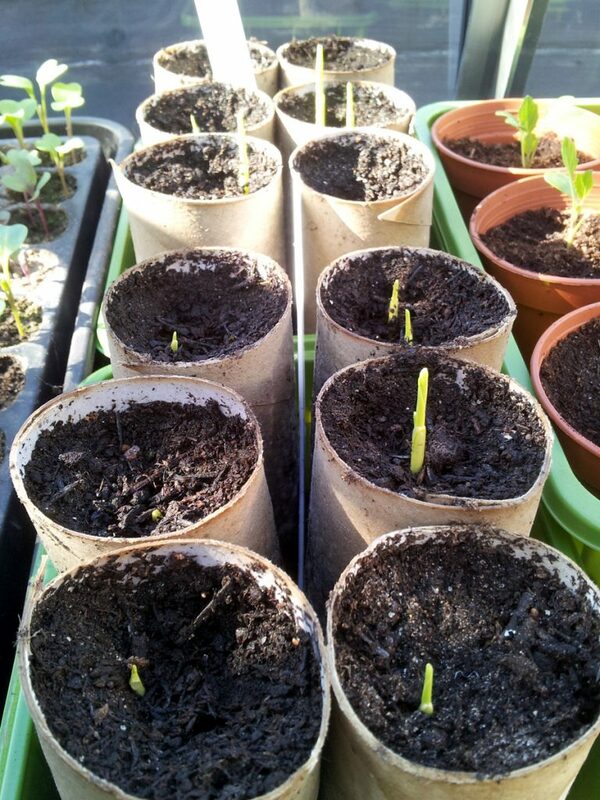 This year’s Zea mays (sweetcorn) crop is just starting out. 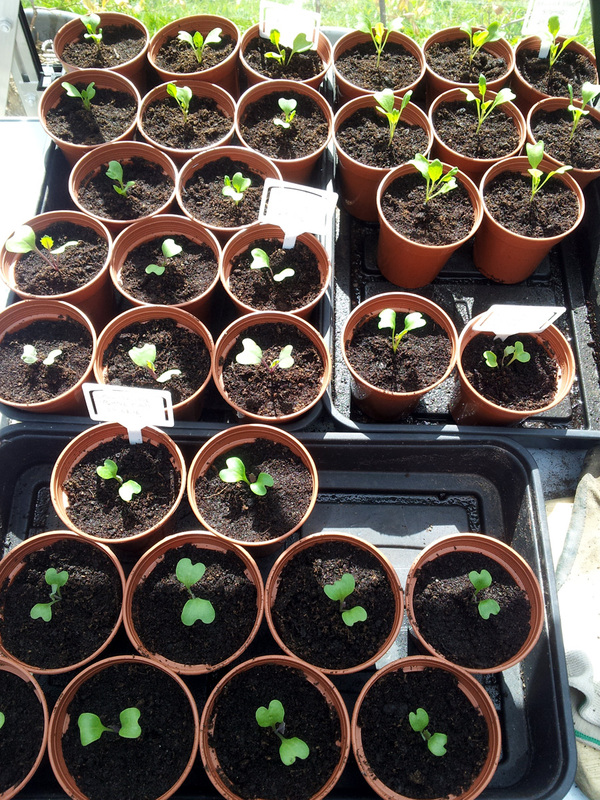 A selection of potted-on brassicas (cauliflower and Brussels sprout) coming along nicely. 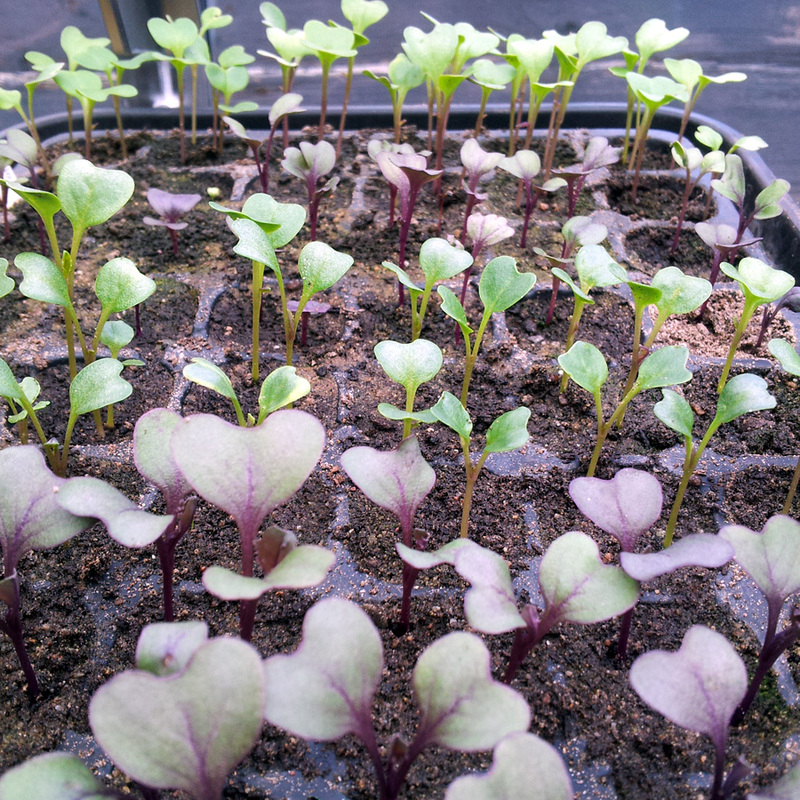 The next batch of brassicas (kale and cauliflower) aren’t too far behind. 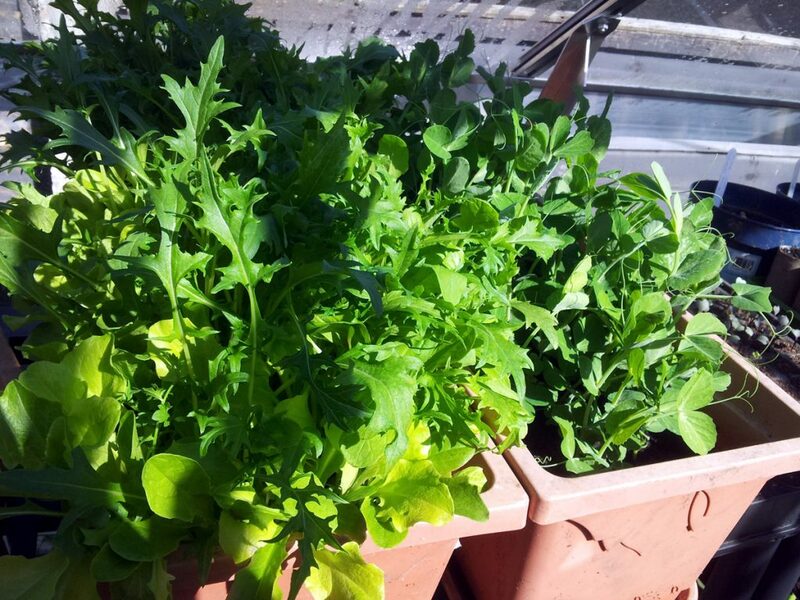 Lovely, fresh mixed salad leaves and pea shoots. The forecast for the weekend is a bit more promising. If there’s no frost on the longer-range radar then we’ll start moving a few things out into the newly re-stained cold frame to begin hardening off, and all being well we can take them down to Plot #59 in a couple of weeks’ time.